Since abandoning my west coast home in favour of the pseudo-european delights of Edinburgh, I now make a trek homeward every year… and this year my fall visit to the Pacific Northwest is even more exciting than usual, as it is preceded by a teaching tour up the coast from California! Starting at the beginning of October in LA, I will be taking in the sights and knitting pleasures of pacific coast, with classes and trunk shows booked at WildFiber (Santa Monica, CA), Monarch Knitting (Pacific Grove, CA), A Verb for Keeping Warm (Oakland, CA), Tangled Purls (Salem, OR), Twisted (Portland, OR), Maker’s Mercantile (near Seattle, WA), Urban Yarns, and SweetGeorgia Yarns (Vancouver, BC). I will be teaching classes on the POP and Vivid blankets, plus some very exciting DIY (design it yourself) workshops to guide knitters as they design their own hat or lace shawl! See the full list of tour dates and classes at the bottom of the post. 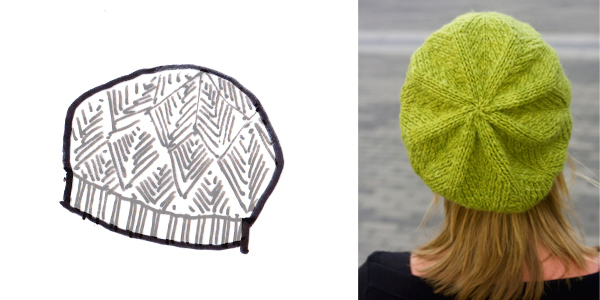 DIY Hat ::: Intro to design workshop – with Emily’s tips and guidance, bring your own design ideas to life! A GREAT (knit) ADVENTURE in the wild west! Sunning myself, teaching, sightseeing and excessive amounts of knitting are NOT ALL that I have planned! I’m hoping to cross paths with some west coast designers and knitters too… to chat design and tell you all about it on the blog. I’m hoping to meet with Stephannie Tallent (sunset cat), the Knitmore Girls, Leethal Knits, Rebecca Danger, Jane Richmond, and hopefully some more super cool knit cats as I make my way northward! Watch the blog, where I will tell you all about the trip! My final destination is Vancouver, and if you are in town you are in for a treat – my excellent design partner Alexa and I are going to be in the same room at the same time (it’s rare!) at this year’s Knit City (October 26-27 in Vancouver). Be sure to stop by and say hi! JOIN IN and DROP ME A NOTE ::: I’d love your recommendations! Are you a west-coast knitter who wants in on the action?! Book a class (full list below), come and check out the samples at one of the trunk shows. Recommendations? 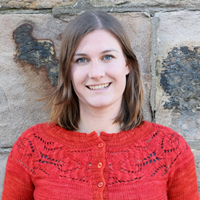 I would also LOVE to hear from you directly with recommendations for knitting meet-ups to go along to, plus your favourite shops along the coast! Send me an email with your suggestions: tincanknits@gmail.com – I look forward to hearing from you! Stay tuned (on Facebook, Instagram, and Twitter) for further tour dates to be announced, and to follow along on my adventure! And if you don’t already get our email updates, click here to get on the list! I will be adding a few more shops to the list before this tour is over! Make sure to check back, or follow us on Twitter for upcoming classes! Portland is also where the fabulous Colette patterns are based. Sewing patterns with a lovely vintage feel, which would go beautifully with your knits. In Portland, if you get a chance to go to any other yarn stores, Happy Knits and Pearl Fiber Arts are both great – there are a LOT of yarn stores in the portland metropolitan area! I’m going to try and come and meet you friday evening, if I can make it down that way, with either my Low Tide or my Bonny!! :) for food, Portland is also a mecca for foodies, if you have breakfast time, Bumblekiss in NE portland is one of my favs or Mothers downtown. Henry’s is downtown near Powells and has a lot of northwest stuff including a lot of beers (original location for Henry Weinhard, I think). You have two different dates for Sweet Georgia, Oct 20th and Nov 2. I’m assuming it’s Nov 2 because you are in Washington for Oct 20. Can you confirm? Two suggestions lys to visit: Gather DTLA (Downtown L.A.) at 5th and Spring Streets, located on the 2nd floor within The Last Bookstore. They are not open on Mondays, but open at 12 Noon most other days and they stay open late. As far as parking is concerned, I would highly recommend parking in a lot, that way you don’t have to worry about running to feed a meter or getting a parking ticket. Another store to visit is The Knitting Tree in Culver City right off the 405 S Fwy. Both stores are the latest additions to the lys scene and are worth visiting. If you want to experience the latest in yarny goodness in LA, you should try to hook up with the fabulous ladies of the Yarnover Truck. It’s pretty awesome! wow, so exciting! if you happen to make a stop in santa barbara, loop & leaf is a lovely shop. http://www.loopandleaf.com/ and i’m sure they would love to have you! have a wonderful time on your trip! Hi Jamie – 2 baby showers in 1 day?! Seriously? I’m headed up the coast to Pacific Grove for Tuesday evening… so I might still be around on Monday, but it’s not a lot of time! Thanks for the suggestion, though! INSANELY JEALOUS! Gnashing of teeth and hair pulling. Have the best of times! Thanks! It’ll be lonely (I’m going on my own without the man) but I’m sure there’ll be lots of knitters to keep me company! Would love to meet up! When do you get in to LA? I’m leaving for Taos on the 4th. Yay! See you at Knit City! So excited to finally get to meet you in person!!! Woot woot! Looking forward to hugs at KnitCity! :) Have a safe trip! Thanks Shannon! I can’t wait to meet you too (haven’t we already met?! Obviously I just think I know you through your work and photos and Alexa! Wow! Knit City is going to be… !EPIC!… with you both there. I’ve signed myself up for the DIY Hat class already since it’s something I’ve been toying with. Great! The design classes are SUPER fun. Since it’s a single session, you’ll get the most out of it if you come with a few ideas / stitch patterns in mind, just FYI. have a great time there :) the DIY classes sound very interesting!